If you are looking for a browser supported ‘text-to-speech’ plug-in, here is a site that lists what you could use for a particular browser – http://dyslexiahelp.umich.edu/latest/text-speech-and-other-plugins-web-browsers. I’m going to register on the site to see if this provides the access to this information – here’s crossing my fingers that it does!! For those teachers who are having issues with their SMART notebook where the flash objects (the interactives) are not working properly, there is a fix. What has occurred is that the newest flash upgrade is NOT compatible with the newest version of SMART notebook! At temporary fix is to ‘downgrade the flash version’ which I’ve done and it works well. Here is the link to the fix which involves a three step process (which I should indicate is designed for the PC environment – not sure about the Mac environment) – tinyurl.com/flashKB. I think we may have found the replacement for Audacity!! It’s called Audio Expert (http://www.audioexpert.com). The site allows students to record, convert, edit, merge and mange audio clips with no software to install!! Thanks Pete! We’re working on creating a template so that all of the courses we’re accessing from the Rockyview Hub (a consortium of school divisions who have willingly shared their Moodle courses for other districts to use!) will have a common appearance and functionality. By doing this, students should be able to go from one course to another and not have to worry about figuring out the different setups. Last week, the Palliser Admin got together for three days in Calgary to focus on Literacy. This is a major focus for Palliser this year and we are very fortunate to have two very passionate and knowledgeable staff to help carry us forward. Connie A. and Bev S. put together what every Administrator said was ‘by far the best ever PD they had taken part in! !’ Way to go ladies and the seed has been planted and now we look forward to the germination process as Admin gets all teachers on the same page – ‘Every Teacher is a Teacher of Literacy’! It’s not just the English/Language Arts teachers who promote literacy – it’s EVERY teacher!! I was fortunate to be a participant at this year’s Wolf Creek Technology Symposium. This is a Wolf Creek PD day for their teachers which has its sole focus on technology. As a result, they had many breakout sessions available which covered many areas of classroom use. Hall Davidson was the keynote speaker to start the day. He was entertaining and was able to share some of the technology which teachers can readily access. Being that he works for Discovery Education, he was able to plugin some of the resources offered by Discovery. One item Hall shared was that of ‘Mystery Skype’? What happens through twitter, two schools hook up. Neither school knows where the other resides. The two classrooms connect via chat, email, Skype and share ‘clues’ which the other school then takes and tries to determine where it is that they reside. It’s free and it could be a great Social Studies related activity!! Go on with your twitter account and use the following to get connect – #mysteryskype. The augmented reality session with Dan McWilliams was my favorite or the day. Dan works at the Calgary Science School where the students work in an Apple based 1:1 environment. Div II students each have their own iPad while the Div III students work with the Apple Air laptop! Through the efforts of Dan, the students are doing some really creative work in the area of augmented reality. Using tools of Aurasma, Augment and String (all apps available through the Apple App store and FREE! ), the students have ‘triggers’ or ‘markers’ throughout the school showcasing and demonstrating mastery of the various outcomes assigned in class. These tools allow students to be really creative in how they create knowledge in the classroom. Dan also share how the browsers as we know them have evolved into augmented reality (AR) browsers. Try out the following AR browsers – Junaio, Wikitude and Layar. I installed Junaio and wow!!! If you want to get a feel for what is coming down the road in regards to Google Glasses – try it out. Once Junaio is running, you can have it search for instagrams, Wikipedia, twitter feeds, etc. – and as you are walking around, you will see pop up on the iPad (or iPhone) all the feeds. It really is a remarkable technology!! But already we found a very potential issue. If a student were to leave their ‘locations’ on, their feeds would allow these AR browsers to actually ‘locate’ them – direct them and give the distance they are from the browser! Really does have implications here which will really have to be addressed. Students will definitely have to be made aware of this and its possible implications!! On a side note – need to convert units? Go to a Google search page (http://google.ca) and in the search bar, type in ‘unit converter.’ You will then have a nice little unit converter which can easily manipulate. I was fortunate to spend a day with Tim Lee at a Google IT workshop hosted by Wolf Creek last September 25th. Tim has both a strong teaching and IT background which makes him a key resource person when it comes to implementing the Google Apps for Education (GAFE) into a school district. During the day he was able to share a lot of ideas and, needless to say, I was a bit overwhelmed at times. I would like to share some ideas and neat tools from this workshop below. If you ever need to move ALL of your email from one to another, try Yippie (http://www.yippie.com/)! Right now, it doesn’t work well moving from one Google account to another Google account, but that will come in time. So if you wanted to move from an MS Exchange account to a Google account, Yippie would be the tool to move all of the mail data! A couple of tools that one could use to ‘backup’ their data are Backupify (http://backupify.com/) and Migrationapp (http://migrationapp.com/). This would be useful especially for students who graduate from school. They could gather up all of their work from their Google account before the GAFE account is deleted. Email Spam in Google – in essence, Google is a tool/service that ‘learns’ from how you manipulate your data – in this case, your spam in your email account. The recommendation is that you should be checking your Spam folder periodically and deal with the mail that is collected in it. Let’s say that a particular email is place in your Spam folder when it first arrives. If you leave it there, Google will ‘learn’ that this is indeed Spam. But if you were to move it to your Inbox, Google will ‘learn’ that this isn’t Spam and that it should go to your Inbox. So you don’t have to whitelist or blacklist email coming in like you do in other email programs. Google will learn from your actions how to deal with incoming email. If you are using Chrome as your default browser, and I hope that you are, go to the Chrome Web Store and install ‘Canary.’ You can’t install Canary on the Chrome Books because this tool is already available on them. It’s designed to run on desktop and laptop computers. Basically when it’s installed, you have a shortcut that allows you to quickly access all of the chrome apps that you’ve installed and are active. If you are still stuck on having to use the MS Word as your word processor, there are work arounds. I’ve shared earlier that through the Chrome Store, you can install ‘Sky Drive’ which will give you Word, Excel and PowerPoint access on your Chromebooks. Another chrome app is QuickOffice – this app will give you the ability to edit ‘natively’ a word document on your Chromebook. If you are looking for a paid service (who doesn’t!! J), Synergyse (http://synergyse.com/) provides training for using the different GAFE tools (calendar, Drive and mail). As in the past, I want to share some of the neat links that Pete Mackay has shared over the last few weeks as part of his ‘Teacher List’ (http://www.theteacherlist.ca). Check these out!! From the Institute for Innovation in Second Language Education Consultant. A great (no cost) tool for simplifying more difficult English and has a lot of features to aid in reading comprehension and vocabulary development. Be sure to watch the demo to get an overview but don’t forget to check out the learning games at the bottom that are generated with the user content. This site that offers 30 minute clips of nature noises. Ranging from birds to ocean waves and storms, they might be a good way to help students block distractions while they work independently. This site attempts gather and sort fascinating letters, postcards, telegrams, faxes, and memos. Students enter text into the four lines of this simple form and press the “Make the sign!” button. The image on the page will update with the entered text. The image can then be downloaded and used in presentations or other projects. From the site: “Roald Dahl is the most successful children’s writer in the world, famous for his rich descriptions, humor and unusual language. Check out this site for his books and other usable classroom resources. “Between the ages of 13 and 15, Anne Frank wrote short stories, fairy tales, essays, and the beginnings of a novel. Five notebooks and more than 300 loose pages, meticulously handwritten during her two years in hiding, survived the war.” There is a lot more information available on this site, a joint exhibition of the United States Holocaust Memorial Museum and The Netherlands Institute for War Documentation. Jodie Coston’s 10 lessons to learning photography were originally published in 2004. Jodie Coston is a freelance photographer who lives in northwestern Montana. She has exhibited her work in gallery exhibitions around the world and has won numerous international awards for her images. They will serve as an excellent introduction to photography for students. Getting into Google Apps for Education, this list compiled by blogger Med Kharbach (@medkh9) might be useful. This list will offer you a variety of tutorials and guides that will bump up your game in the world of all things Google. Have you ever wondered just how much data is being created, uploaded, shared and shuffled around the Internet? Here’s a site that will put it in perspective for you and your students. 2Learn.ca’s site, Your Digital Presence, has a new section entitled “Open Use Multimedia Resources” in which you can find links to several sources of media for use by students and teachers. This tool will help the Design Studies crowd factor in the sun’s position when planning a home or rooms in a building. Enter the parameters like your location, date/time, room and window dimensions and the tool calculates where the sunbeams will be. It’s a simple tool but it’s a detail that could be very useful when doing the drawings. The tool is offered by sustainable design consultant, Christopher Gronbeck. Check out the other tools and projects on his website! This site could offer an activity for when the school year wraps up. Author and illustrator Robert Sabuda shares many easy to make pop up cards with easy to follow directions. Download the pdf pattern and print on cardstock. The instructions are included in each pdf. Students may even want to color the patterns before they fold and glue them together. Wouldn’t it be great to have an automated web assistant? You can now with IFTTT – a site built on the idea that a conditional statement can be applied to any situation with our various web 2.0 accounts. For example, IFTTT offers a ‘recipe’ that uploads any tagged photos of you on Facebook to your Dropbox folder. Another is to send yourself an email if the forecast includes rain/snow/sleet/hurricanes. There are over 3000 pages of shared recipes from IFTTT users and you can make your own as well. 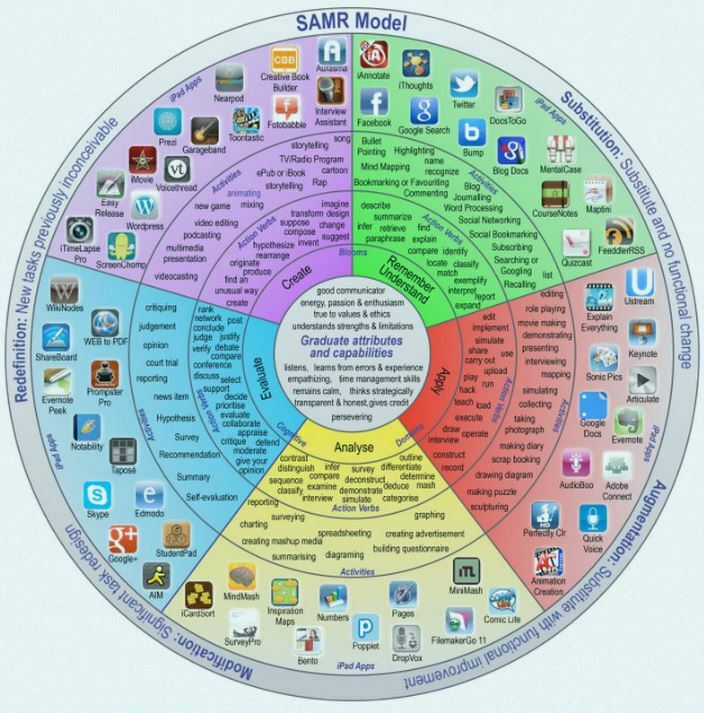 Don’t even get me started on all the possibilities with your Google Apps for Education tools! This collection of animations supports the teaching of geology. Founded by the W. W. Norton Group, students can visualize many aspects of geological study from the hydrologic cycle to more advanced concepts such as the formation of ocean crust and igneous rocks. Reading Bear is a vocabulary building activity that introduces and reinforces main phonics rules. There are 50 presentations for students, all offered at no cost, thanks to an anonymous benefactor of the program. The activities are supported by video clips and interactive slide shows that can be covered at an individual’s pace. The best way to describe EdCanvas.com is a gathering tool. 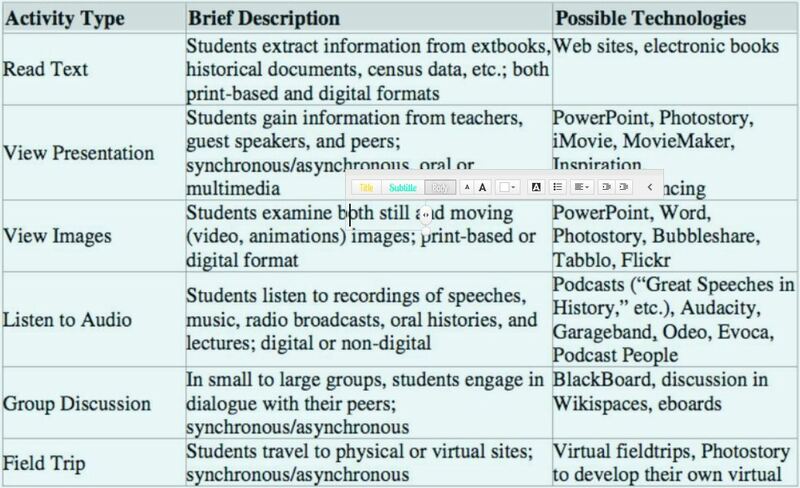 Students and teachers simply drag resources like urls, images, and files to each box. The boxes can then be presented like slides but the cool thing is that the collected resources are live within the box. Users can also share their canvasses with each other. Try having students or session attendees collect resources during a lesson – it’s quite powerful! Whether you are an expert or just starting down the path, here’s a site to use when prepping a presentation. It has a lot of tidbits that could make the difference to your practice. Pro-Music.org is a digital music portal that has three main categories. The first is a collection of music services where students can find sources of music online. The second is a question/answer section that discusses how to legally access music online. And the third section offers information about the music industry in general, including a collection of educational resources. As students and teachers continue to increase their reliance on digital audio assets in their studies, this site will be an excellent trailhead for everyone. Looking for a simple way to add pop-ups to a photograph. ThingLink allows a student to add video, images, audio, links and text to photographs to enhance their digital storytelling projects. It’s perfect for those with younger students or who are starting down the road to more complex digital storytelling tasks. Citation Machine makes it easy by having students (and teachers) fill out a simple form and the properly formatted citation is provided for inclusion into a bibliography or other resources list. Common formatting includes MLA, APA, Turabian, and Chicago. The forms accept multiple types of resources from print, web, images, audio and so on. Answer Garden is a new minimalistic feedback tool. Use it as a tool for online brainstorming or embed it on your website or blog as a poll or guestbook. Automotivator allows you or students to create those corporate style motivational posters. You could use the tool to create those traditional posters or find other uses such as satire or to frame a student response. Students may use stock images or upload their own, add text and save the jpg to a local computer. One problem with other tag or word cloud sites is that it is difficult for students to save their work as an image that can be placed in another project. Word Clouds For Kids makes it very easy for students to print or save their results as a jpg. There are some basic controls like a slider to adjust the number of words used and the results can be edited for color, font, layout, etc. Over the summer, Palliser IT was busy upgrading our wireless infrastructure by installing Aero Hive Aps in all of our schools. With the increased bandwidth at the head end and the new Aps, we now have a greater capacity to accommodate BYODs. Last week in a 24 hour period (and realistically, it was over a 7 hour period considering the actual length of time students and teachers are at school) there was over 240 GB of data downloaded from the net!! Of this 240+ GB of data, roughly 183 GB was iOS specific – the day that the new iOS 7 came out. On top of this, 80% of the devices during this time were BYOD in nature!!! So it would seem that students and staff were clearly taking advantage of the newly upgraded infrastructure!! As a result of this event, we now know that our upgrade definitely has depth or the robustness to accommodate the onslaught of the increased number of BYODs coming into our schools. This is true but we need to understand that this type of usage comes with a price – with all of the devices competing for bandwidth, the speed of navigation will be significantly decrease! During this period, our network was close to being bogged completely down. With this said, we all have to address the idea of ‘network courtesy!’ In one report (http://www.ecampusnews.com/featured/featured-on-ecampus-news/bandwidth-college-campuses-134/?) there was an indication that on one campus, there were as many as 7 web-connected devices PER STUDENT!! I don’t think that this is very likely in Palliser but I think it’s safe to say that there might be at least two web-connected devices per student. So with this in mind, we ALL (teacher too!) need to practice network courtesy. This is simply a matter of, if you have more than one-connected device, turn off the wireless on those devices you are not using. By simply doing this, we can help in alleviating the ‘stress’ place on the district wireless network and thus, make accessing the net a more effective and efficient experience! !